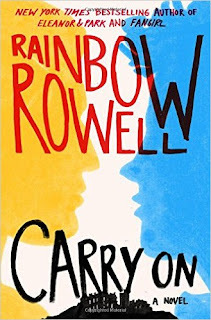 I read Rainbow Rowell's newest book, Carry On, last week and I CANNOT. HANDLE. THE. LOVE. Like, seriously. I am borderline (over the line) obsessed. Do you want to know how bad it's gotten? I have started listening to book playlists. PLAYLISTS! Of songs that remind people of the book! I am listening to one RIGHT NOW. And grinning! Because, I AM ALL IN. Also, in full disclosure fashion, I am addicted to the random fan art and quotes people are posting on Tumblr. I CANNOT HELP MYSELF. So what is Carry On, you ask? Why am I so obsessed? WELL LET ME JUST TELL YOU. Back in 2013 Rowell wrote the book Fangirl, which, for the record, I ALSO totally geeked out over and adored. (Rainbow Rowell holds keys to my heart). In that book, the main character was extremely active in the fandom (NOT OBSESSED) with a Harry Potter like book series about a boy wizard named Simon Snow. The book Fangirl had excerpts from the "real" Simon Snow series, then also excerpts from the main character's fan fiction, in which she had the main character, Simon Snow, and his arch nemesis Baz (think Draco Malfoy), falling in love. (That's right) I enjoyed the parts of Fangirl when it went into the Simon Snow world, but they weren't my favorite parts. Sometimes I thought it interupted the flow of the main story because I LOVED THAT STORY SO MUCH TOO. I never had any thought of going into the world of Simon Snow, it was just a piece of Fangirl. THEN I found out that Rainbow Rowell was writing her own take on the Simon Snow story. This wasn't the original (fictional) eight book series, and it ALSO wasn't the fan fiction written by the main character of Fangirl. This was Rowell's own take on the story. Her own fan fiction (or original fiction...) of her the made up world inside the world. Also, sorta confusing to explain. And honestly I was not at all convinced I would like the story. It's one thing to have the framework of a Harry Potter like story with two boy wizards falling in love as a backdrop for the Fangirl book, but I wasn't sure it would fly as it's own book. Could Rowell really wrap an entire magical world up in one book? Would it feel forced? Or cliche? How on EARTH could this actually be good? I love these characters. I love the world. I love the flaws and the diversity and the LOVE. I think of these characters, and an unpreventable grin spreads across my face. I AM SO ADDICTED TO YOU, SIMON SNOW AND BAZ PITCH (AND PENNY! AND EVEN YOU, AGATHA!). There is something about this book... I think it may be the combination of the Harry Potter framework with Rowell's ability to write these characters that crawl into my heart... I don't even know. But it's so so good. And here is the thing, I don't think you don't need to read Fangirl* to read Carry On, because it is it's very own thing. And that thing is, for lack of a better word, sorta magical. By the way, we are such book twins.